Langkawi is a Malaysian island located on the west coast, part of the state of Kedah, on the border with Thailand. We reach it by ferry from Georgetown, Penang. We leave at 2.30 pm and the trip lasts almost 3 hours for a cost of 70 RM, or about 15 euros. It has been a very bad journey, not because of the sea conditions, but for the lack of air in the ferry, except for a small fan. We arrive in Kuah, the capital of Langkawi and we take Uber to reach Cenang Beach, the area where most of the hostels are located. This beach is a good spot for the sunset and to relax with live music. We stay here for 3 nights at the Villa Thai hostel, paying around 4 euros for a bed in a mixed 18-person dorm. The hostel is very nice, with good vibes and very friendly staff. This is a basic hostel, perfect for every backpacker. Here we also rent a scooter for 30 RM per day (around 6 euros). We highly recommend renting a vehicle to move autonomously on the island given the lack of public transport. In general, the roads are good and the places of interest are well indicated. You should not have problems moving around even with a map. One of the main attractions of the island is the Sky Bridge, a curved bridge suspended at 660 meters above sea level. It can be reached by a cable car. The cost of the cable car + Skybridge ticket is 55 RM (about 12 euros). We arrive here at 11 am and we manage to get on the bridge only at 2 pm! Indeed, there is a lot to wait for purchasing the tickets and to get on the cableway. The view, however, fully pays back! From here you can even see the nearby Thai islands, surrounded by a turquoise sea. From this height, it is easy to appreciate the lush vegetation that prevails on the island. Not far from the Skybridge, you can also visit the Seven Wells Waterfall reachable by walking for about 20 minutes through many steps. After all this sport under the sun, you need to immerse yourself in these small and refreshing natural pools! Continuing north-west, we stop at Skull Beach, a small beach with white sand and warm water. Probably, however, the most beautiful beaches are those located in the north. One of these is Tanjung Rhu Beach, surrounded by majestic mangroves and a wide white sandy beach. The atmosphere is really relaxing. Here, in fact, there are very few tourists and it is pleasant to rest in the shade of the many trees close to the sea. For those who want a bit of fresh mountain air, do not miss the view from Mount Gunung Raya, 900 meters above sea level, overlooking the South Bay of the island. 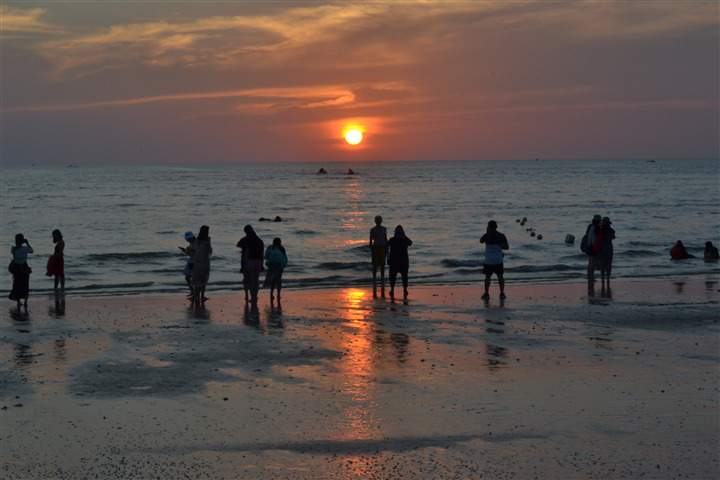 Finally, the beach of Cenang is great for enjoying a beautiful sunset, with great live music in the background. Moreover, on the main road you can find any type of restaurant or shop a little more touristic. Obviously, just move slightly away from the center if you are looking for cheaper food, but it is still great for a walk after sunset. Furthermore, the island is recognized as a duty-free area for the purchase of alcohol, cigarettes and chocolate. Do not miss the Thursday night market, just near the hostel. Here it is easy to taste some of the local cuisines at very reasonable prices. In short, maybe Langkawi is not a paradise island compared to the nearby Thai islands, but certainly offers a wide range of activities into nature as well as beautiful white sandy beaches!